Senate lawmakers on Thursday unveiled their first major legislative effort to increase transparency in online political advertising, called the Honest Ads Act. 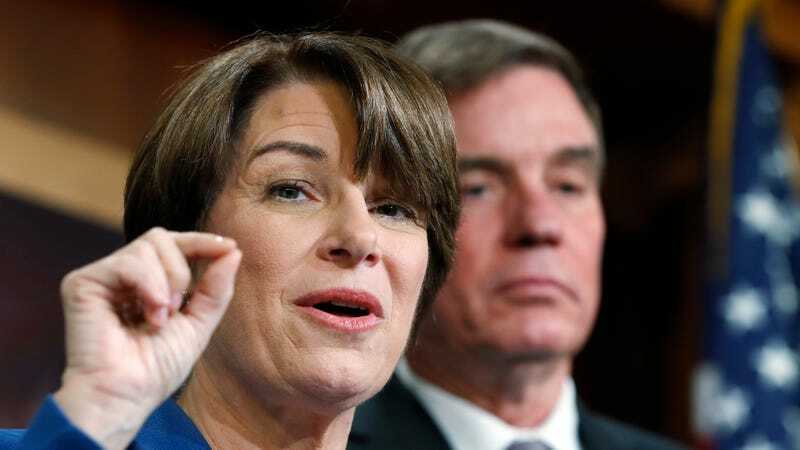 Sponsored by Senators Mark Warner, Amy Klobuchar, and John McCain, the bill attempts to align rules for online advertising with those broadcast on television and radio airwaves. “We understand that election security is national security,” Klobuchar said today at a press conference. The Honest Ads Act would require online platforms like Google and Facebook to include disclosures identifying the purchasers of ads, maintain a “public file” of ads about candidates and issues of national importance, and do a better job of policing their sites to prevent political influence funded by foreign nationals, Klobuchar and Warner explained. The new rules would apply to any entity that spends a cumulative $500 on online ads during an election cycle. “If a candidate or a cause buys an ad on TV, the same rules should apply if they buy it on Facebook or Google or on Twitter,” Klobuchar said. Specifically, the bill would amend key portions of the Federal Election Campaign Act of 1971. Provisions that describe rules placed on traditional media outlets—such as “broadcasting stations,” “newspapers,” and “magazines”—would be modified to include “satellite, paid Internet, or paid digital communication.” Moreover, it amends the Act by requiring social media networks (in addition to television and radio broadcasters) to make “reasonable efforts” to ensure that political ads are not “directly or indirectly” purchased by a foreign national. The Honest Ads Act, which was drafted with the aid of the nonprofit Sunlight Foundation, is a response to the widespread reports of Russian-funded political ads that ran on Facebook, Twitter, and Google during the 2016 election. However, Facebook has said that the ads purchased on its platform pushed divisive messages about issues like race and sexuality but rarely mentioned candidates by name, meaning that they wouldn’t be covered under current political advertising law. “With every new story about Russian bots or bogus information or shadowy ads we don’t know the source of, we need to acknowledge the nature of politics and campaigning is changing,” Warner said, calling for increased scrutiny of American tech companies. The bill has support from the nonpartisan Campaign Legal Center. “The 2016 elections exposed glaring holes in our ability to police foreign intervention in US elections, and this bill is an appropriate, bipartisan disclosure remedy,” said Trevor Potter, president of the CLC and a former Republican Chairman of the Federal Election Commission. Warner said he was hopeful that leaders of tech companies would work with Congress to move the new regulations forward. “The difference between how Facebook reacted in the immediate aftermath of our election—where they were dismissive when I raised these concerns about what happened—by the time of the French elections, where Facebook took down 50,000 accounts, shows this became much higher on their radar screen,” Warner said. A Twitter spokesperson didn’t say that the company would support the Honest Ads Act as drafted, noting, “We look forward to engaging with Congress and the FEC on these issues.” Google also offered muted support for the bill. “We support efforts to improve transparency, enhance disclosures, and reduce foreign abuse. We’re evaluating steps we can take on our own platforms and will work closely with lawmakers, the FEC, and the industry to explore the best solutions,” a Google spokesperson said. “I’m not going to tell you they support this bill right now,” Klobuchar said of tech companies during the press conference. Update, 3:12pm: A companion bill to the Honest Ads Act has just been introduced in the House. The bill is sponsored by Rep. Derek Kilmer, Democrat of Washington, and Rep. Mike Coffman, Republican of Colorado.